Increased study of the nature of planetary interiors, as well as the current effort to produce inertial confinement fusion, both call for an understanding of matter at ultra-dense states, characterized by pressures in the terapascal range (TPa, tens of millions of atmospheres). The possible existence of carbon-rich planets has created interest in the behavior of carbon at these conditions. 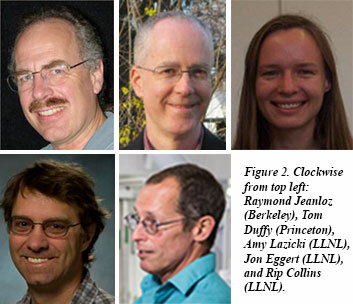 Now, a group from Lawrence Livermore National Laboratory and UC-Berkeley, including current and former CDAC Academic Partners Raymond Jeanloz and Tom Duffy, former Carnegie-CDAC Postdoc Amy Lazicki (LLNL) and CDAC Steering Committee members Jon Eggert and G. W. (Rip) Collins (both from LLNL), has carried out ramp compression experiments on carbon to 5 TPa at the National Ignition Facility (NIF) on the Livermore Laboratory site. compression of the material. 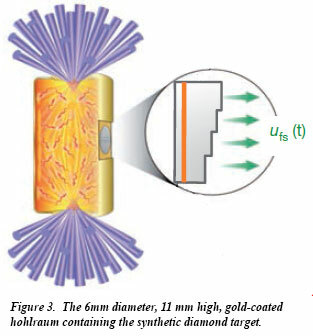 Four thicknesses of the diamond sample effectively allow multiple sample runs within the same experiment. Velocity interferometry is then used to create a stress-density profile that characterizes the load on the sample. Because ramp compression is more controlled than shock compression, NIF allows observations in pressure ranges where shock compression data are unreliable and static compression data are not available (Fig. 1). In these experiments, data was obtained on carbon at peak stresses of 2.7, 3.7 and 5 TPa, resulting in a 3.7-fold compression of the material and a density of 12 g/cm3, greater than the density of lead at ambient pressure. 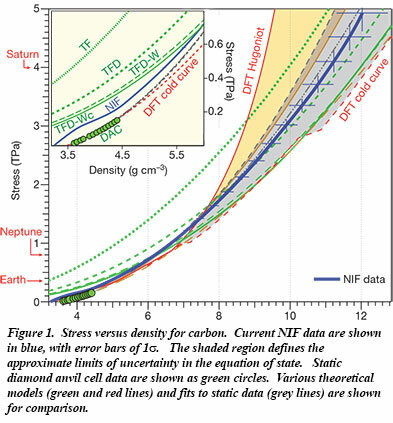 One of the primary uses of the data obtained at NIF is to provide stringent tests of modern condensed matter theory and models of planetary formation. The LLNL team is also collaborating with the CDAC group at Carnegie on experiments on hydrogen and hydrogen-containing compounds to be carried out at NIF in the future [R. F. Smith et al., Nature 511, 330 (2014)].